If you do not see a particular feature or have questions regarding capabilities converting solution, please contact us by filling out our ‘Contact Form’ or call us directly to speak with a specialist -+1 (847)394-5700. Flatbed Screen Printer The flat bed screen printing station is equipped with automatic registration. The unit can register by the movement of the screen or through a connection with a numerical feeding station. The flat bed screen printing station has a sequential vacuum table, a covered operating panel and a continuous GEW or IST stepless UV dryer. The cost of the mesh, frame and pre-press is more affordable than a rotary screen and has less set up and waste. Flatbed Die Cutter The flat bed die cutting unit is has the ability to achieve high quality cuts, precision kiss cutting and is recognized as the best on the market. The unit is able to perform top and bottom die cutting, has a pressure adjustment system with a maximum tonnage of up to 30 Tons and comes with an automatic lubrication device. This unit is equipped with a 12 mm die or magnetic base, and it can use most of the existing tooling for conventional presses. Semi-Rotary Die Cutter The patented semi-rotary die cutting unit combines the advantages of a flatbed die cutting system and a rotary die cutting system. This converting option will allow converters to cut out their labels a variety of step ups. This option is a less expensive tooling option than full rotary because it allows use of flexible magnetic dies with many different step ups on the same cylinder. Due to the low costs of dies, semi- rotary is best suited for short run jobs. Flatbed Foil / Flatbed Embossing The flatbed foil unit has a 2-in-1 use as it can hot stamp your materials and emboss them. This flatbed foil stamping and embossing unit has a pressure adjustment system with a maximum tonnage up to 30 T, electrical heating and has the ability to apply holograms and foil in registration. The flat bed foil unit also has adjustable temperature controls with digital display, an adjustable time of pressure device and can use most existing tools from conventional presses. 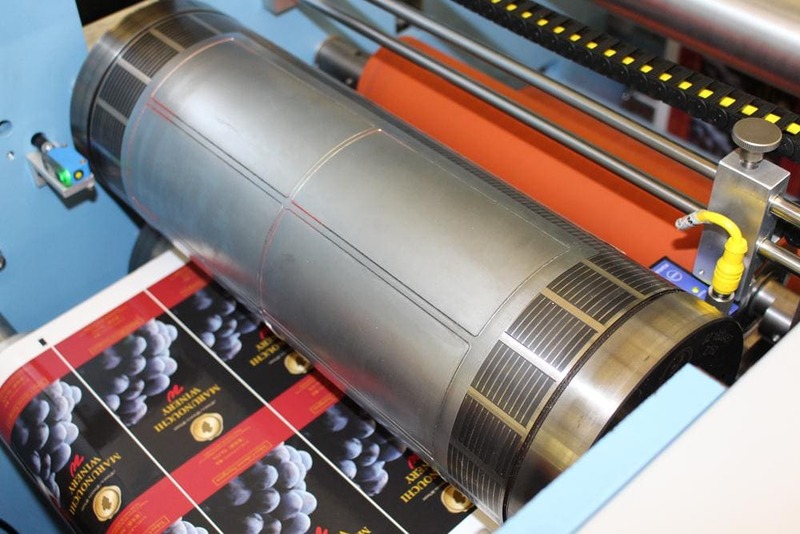 Semi-Rotary Foil The semi-rotary foil unit has a shorter dwelling time than a flatbed foiling / embossing unit which ultimately allows the converter to produce results with a greater level of detail. This unit comes equipped with an oil heater, foil saver and dispro adjuster and a clamped blanket that can be changed quickly and effortlessly. The semi-rotary foil unit comes with a magnesium plate instead of a magnetic system which is a big cost savings to converters. Full Rotary or Semi-Rotary UV Flexo Station The UV flexo station is available in full rotary or semi-rotary and is able to apply lamination, super varnish or cold foil. This unit comes equipped with 2 ink trays, a GEW or IST stepless UV dryer and an Infra-red dryer that has been specifically designed to prime on film and paper material. 400 Watt Laser Die Cutter Spartanics Laser Systems offers state-of-the-art technology that works in conjunction with Spartanics Laser Software, a user friendly workface that makes laser cutting as simple as the click of a button. Label converters prefer laser cutting over traditional die cutting because of the 100% savings on tooling costs and the limitless geometry possibilities.